Groningen, the Netherlands – April 11, 2018. The AGE Reader will be showcased this year at the DDG Diabetes Congress by our German Distributor, MSP bodmann GmbH (MSP). The DDG Diabetes Congress will be held in Berlin from the 9 -12 May 2018. Organised by the German Diabetes Society (DDG), the congress aims to provide an overview of recent scientific developments in relation to diabetes mellitus. Health research services as well as prevention and treatment products will be displayed to over 6000 estimated participants. The AGE Reader provides an immediate cardiovascular risk prediction in 12 Seconds. It has been designed for patient friendly diagnosis and allows doctors to practice personalized care and prevent disease (progression). As an optical measurement of the skin is used, it is non invasive and provides an alternative to cost-intensive laboratory tests. The method is convenient, easy to use and extensively validated. With over 15 years of successful experience in the German diabetes market, MSP has been appointed the German distributor for the AGE Reader last year. They are well established with general practitioners and diabetologists in Germany and will be showcasing the AGE Reader mu at the DDG Diabetes Congress. The DDG Diabetes Congress will provide the platform for the first demonstration of Diagnoptics new product – the AGE Reader mu – connect. 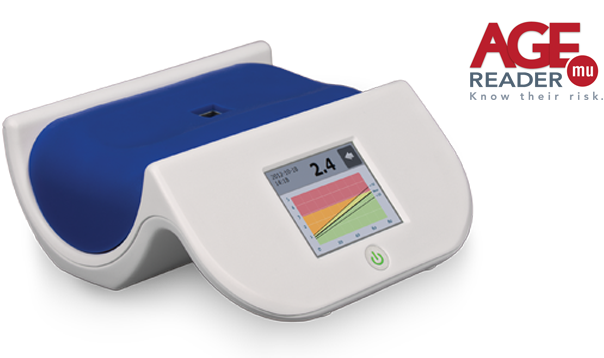 This next generation AGE Reader combines a high measurement quality standard with an innovative design. With the AGE Reader mu – connect it is now possible to send results directly via Bluetooth and save or print via the additional software. You can view the new AGE Reader mu Connect by visiting MSP at the DDG Diabetes Congress from 9 to 11 May between the hours 09:30 – 17:30 (Level 02, stand #31). If you provide further information in regards to Diagnoptics at the DDG Diabetes Congress or The AGE Reader, please do not hesitate to contact us.